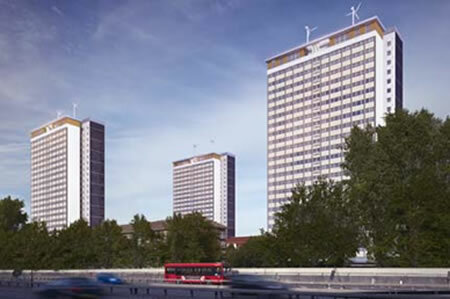 Three existing 24 storey tower-blocks in Edward Woods Estate, Notting Hill (W11) were subject to major renovations. At the top of each block four luxurious penthouse were constructed, each with a reported market value of over £1million and supported by Hammersmith and Fulham Council. Due to the open plan nature of the penthouse suites both building control and the London Fire Brigade required a full fire sprinkler system. At Ultrasafe we custom design bespoke fire sprinkler systems to meet the different requirements and challenges of each project. As an engineered solution Ultrasafe proposed that each penthouse was fitted with its own independent Low Flow Stored Pressure fire sprinkler system. This was readily accepted by the authorities as a workable design solution.